Whitening strips, together with other teeth whitening products comprise one method through which Americans are trying to revitalize their smiles. Over the decades since the sudden discovery of celebrity smiles in 1937, teeth whitening has become a significant part of an individual’s identification. Research reveals the importance of a smile to most individuals is inextricable linked to such factors as career success, social acceptance and attractiveness to the preferred gender. Since this great awakening, various dentists and researchers have applied their skill to create various methods to enhance the smile. Currently, teeth whitening ranks high. It is one of the most common annual dental procedures. According to recent statistics, it is the most popular form chosen to improve an individual’s smile. While veneers remain popular in-office procedures, teeth whitening is sought from both dental professionals and off the shelves. 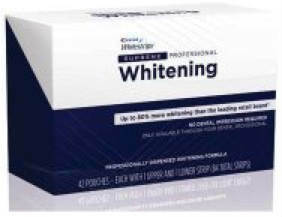 Today, products such as teeth whitening gel, have become commonplace. They find themselves on the shelves of retailers and in pharmacies. While teeth whitening kits containing gel have been around for years, strips are a new advancement. The first ones appeared in 2000 when Crest Whitestrips began to appear on the shelves. 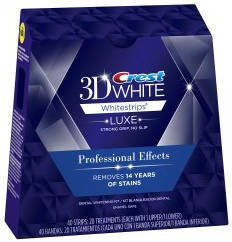 In a recent Forbes article, Dr. Michael Apa recommended Crest Whitestrips for at home teeth bleaching. Yet, strips do present certain disadvantages. Whitening teeth strips consist of two conjoined elements: the polyethylene plastic strip is thin, clear, and flexible. The strip is a delivery system. It also acts as a protective device for your gums. Coating one side of the strip is the active agent for bleaching or whitening teeth. This is hydrogen peroxide. The problem with strips is not considerably different from those associated with other methods of teeth whitening. Obvious ones include the length of time to achieve whiteness. Strips require weeks while in-office can produce results within hours. This is specifically true of the laser teeth whitening procedure that only takes place in-office. In common with all whitening methods, whether it is teeth whitening gel or gel pens, the side effects may be irritation of the gums. Another potential problem is tooth sensitivity. Nevertheless, strips may be the right method for you. Since 2000, whitening strips have become a popular choice for improving a smile. Whether the choice is the original –Crest Whitestrips or any of its competitors, people are learning to use this simple way to a brilliant smile.